Traveling by train can’t be a more safer way to travel this fall. Here, an Amtrak Northeast Regional train prepares to depart from Washington, DC’s Union Station. Traveling on Amtrak is the best traveling experience anyone can have. Amtrak’s on board atmosphere without-a-doubt beats that of the airlines. There’s plenty of leg room, the on board dining is not to be missed, and the scenery makes every trip worthwhile. With the fall season underway, the leaves will soon be changing. Seeing the leaves ablaze in their orange, yellow, and red make every Amtrak journey a memorable one. Before boarding any Amtrak train, it’s paramount to pay attention to the passengers’ checklist. What is the passengers’ checklist? It is five simple steps for Amtrak passengers to follow on any journey. Whether intercity or long-distance, being prepared always makes the journey one to truly enjoy. What are the steps? See the checklist below. 5) Reservations: The Amtrak passengers’ checklist cannot start without making reservations. Before any journey begins, all passengers must make reservations. All Amtrak trains are reserved. 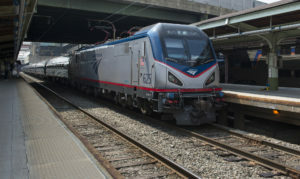 Reservations can be made online at Amtrak.com or via phone at 1-800-USA-RAIL (872-7245). When reservations are made, passengers will be given their reservation codes. If making reservations via phone, it’s a must to remember the agent’s name. The agent will do his/her very best to provide a positive experience for all passengers. When the phone call is complete, passengers should remember to thank the agent for his/her assistance and professionalism. 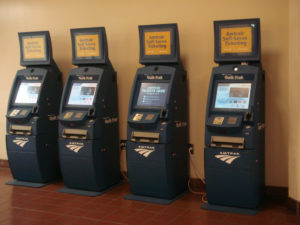 Amtrak’s Quik Trak kiosks are available at all major stations. Passengers use their credit cards as their ID. 4) Obtaining tickets: The passengers’ checklist continues with the ticket issuing process. Upon the completion of the reservation transaction, the reservations agent will have provided to the passenger a reservation code. Amtrak passengers must write the number down. The next step on the passengers’ checklist is to obtain their tickets. Amtrak passengers can obtain their tickets via mail, email, at the station ticket window, or at one of the Quik Trak kiosks. 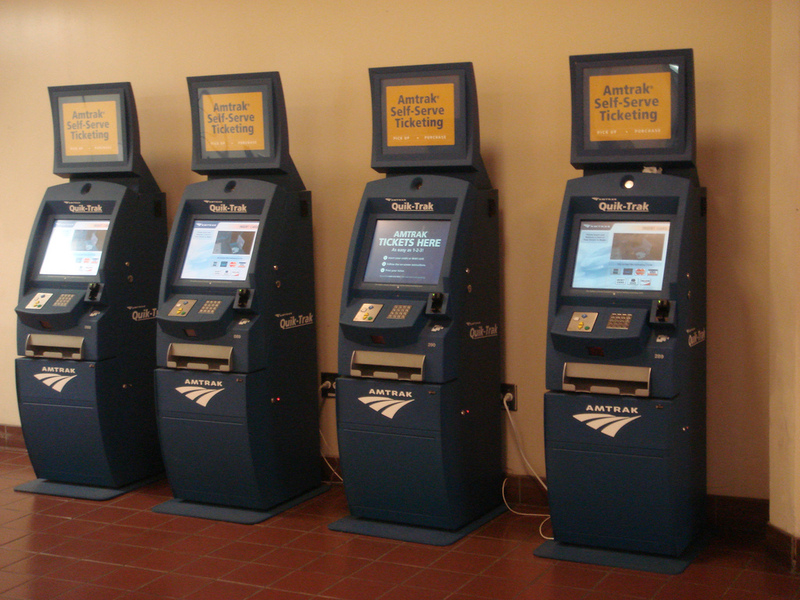 Quik Trak kiosks are available at all major Amtrak stations. Passengers obtain their tickets by using the credit card they used to purchase their tickets. The credit card acts as their identification. At the station window, passengers must provide valid photo ID for obtaining their tickets. Via email, passengers must go to the email message and download their tickets. The ticket printouts will have both train numbers listed, with a QR code shown at the top corner. Passengers must not misplace the printout. A crew member will scan the QR code, both going and returning. If passengers wish to have their tickets mailed to their home, they must make their reservations a minimum of ten days or more before traveling. 3) Using the Amtrak mobile app: What would the passengers’ checklist be without mobile technology? All aboard the Amtrak mobile app! With mobile technology, Amtrak passengers have their train journey at their fingertips. With Amtrak’s mobile app, Amtrak passengers can do a handful of things. Amtrak passengers can track their train’s status, look up schedule information, or even change a reservation. It’s easy, right? Downloading the Amtrak mobile app takes only a few moments. Once downloaded, Amtrak passengers have America’s railroad at their fingertips. The Amtrak mobile app is not just a key part of a journey. 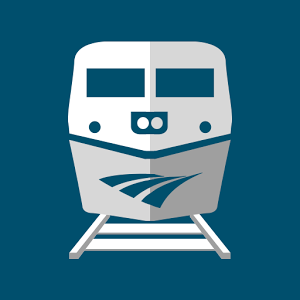 The Amtrak mobile app is a must-have for all Amtrak passengers. Without-a-doubt, it’s a must-do on the passengers’ checklist. With a tap of the app, a riding the rails is moments away. Checking schedules and a train’s status can’t be easier without the Amtrak mobile app. It is America’s railroad at their fingertips. 2) Be at the station “on-time”: Winding down the passengers’ checklist, there is no better way to have a pleasant train journey than being on-time. All Amtrak journeys start successfully when passengers arrive at the station on-time. If traveling short distance (ex. Northeast Regional) Amtrak passengers should arrive at the station thirty minutes prior to departure. If traveling on a long-distance train (ex. Lake Shore Limited), passengers should arrive at the station one hour prior to departure. This allows passengers time to check-in luggage, if applicable. Once on the track platform, passengers are then directed to the proper boarding location. On Northeast Regional trains, the quiet car and business car are the last two cars of the train. On long-distance trains, the train staff will show passengers to their assigned sleeping car berths. Being on-time is a key huge part of Amtrak’s tradition. It is how passenger train travel was meant to be. Arriving at the station on-time ensures all Amtrak passengers a safe and pleasant traveling experience. 1) Respect fellow passengers and crew: The passengers’ checklist concludes with the golden rule. Safely aboard, all passengers can sit back and relax. Before getting comfortable, passengers must at all times respect the on board environment. All Amtrak passengers are encouraged to do two things. All Amtrak passengers must respect their fellow passengers and the crew. Respect begins in the quiet car. Those passengers riding in the quiet car must set their cell phones to vibrate or silent. Secondly, they must keep their voices down. Lastly, they must keep their conversations short. Even in coach class, business class, the dining car, and sleeping cars, cell phones should be kept on silent or vibrate. Aside from respecting one another, passengers should show a great deal of respect towards the train crew. The crew’s responsibility is getting the train to its destination on-time and safely. The safety of the passengers is their responsibility, too. That being said, all Amtrak passengers are to kindly return the favor. Amtrak passengers are responsible for acting safely on board. All Amtrak trains are non-smoking. Passengers are to use handrails when walking in between the cars. No running is allowed on board at any time. Amtrak values safety at the very top of their list. No Amtrak train arrives on-time without the enforcement of safety. A little bit of respect travels a long distance. 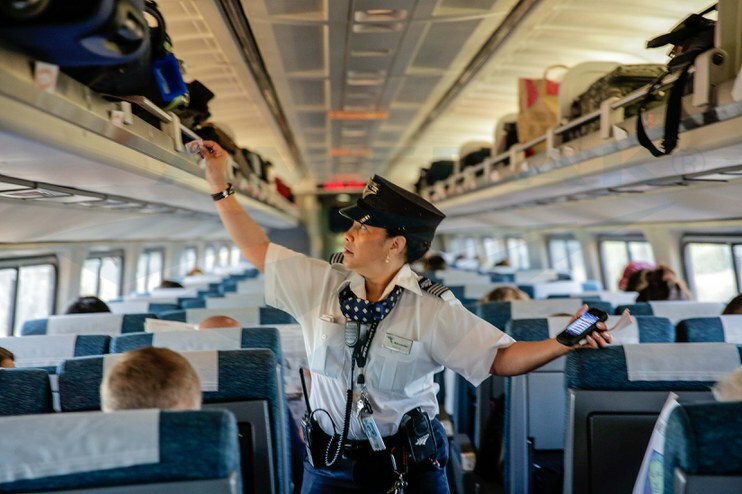 While on board, passengers must respect their fellow passengers and the train’s crew. Here, a conductor is doing a routine seat check. Riding on Amtrak is among the greatest traveling experiences. Whether traveling short or long-distance, the journey should always be one to write home about. No Amtrak journey should ever be complete without plenty of good words shared. More importantly, no Amtrak journey goes successfully without following the five-step passengers’ checklist. All Amtrak passengers should successfully purchase their tickets via phone or online. Passengers should obtain their tickets by one of the methods discussed. Thirdly, passengers are encouraged to use the Amtrak mobile app to check their train’s status. When proceeding to the station, passengers should arrive on-time. The most crucial step of the passengers’ checklist is to respect fellow passengers and the crew. Every Amtrak journey is a shared journey. If passengers carry out their responsibility, the crew can safely carry out theirs. This is why Amtrak has printed on its trains, “A safe team on-time”.